Laurie Hernandez of MG Elite finally took her own junior national title, defeating defending national champion and teammate Jazmyn Foberg by one tenth. She scored a two day-total of 117.50 for the gold. 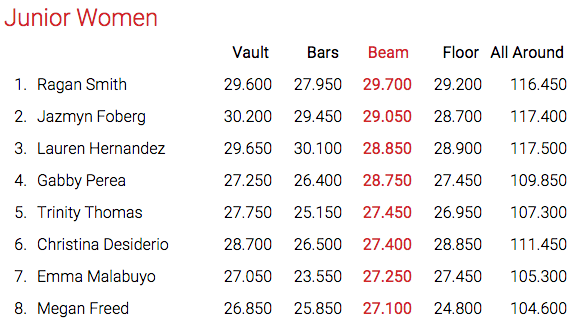 Foberg put up an incredible fight, with her strongest all-around showing yet, scoring a 117.40. Ragan Smith of Texas Dreams wowed the crowd on floor and beam, taking bronze with a 116.45. The juniors entered into day two with Jazmyn Foberg of MG Elite the surprise leader in a bid to defend her national title with a 58.35. She held the lead over teammate Laurie Hernandez who trailed by six tenths. Ragan Smith of Texas Dreams followed by five tenths in third. 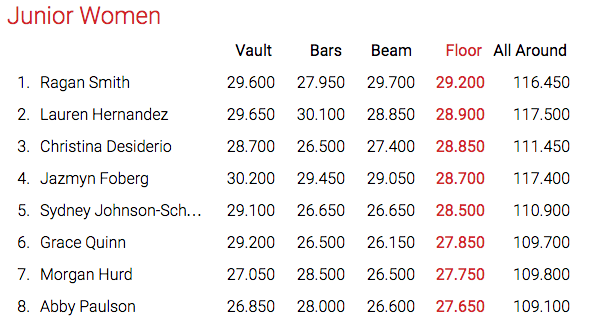 In the first rotation, Foberg led off on vault with her strongest vault yet, a double twisting yurchenko that rivals any of the seniors, scoring a 15.2. 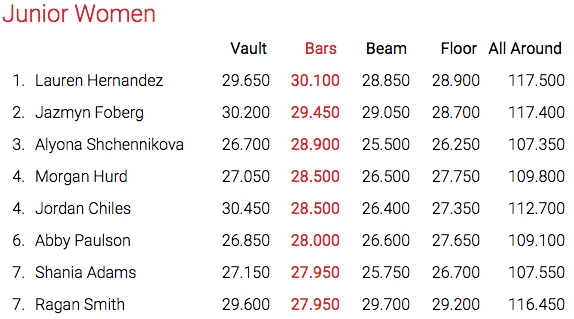 Hernandez followed up with a strong vault of her own, scoring just below her with a 15.1. Smith started on beam, where she delivered a rock solid beam routine worthy of a senior world team finals, scoring a 15.2. Aloyna Shchennikova scored a 14.35 on bars. The three leaders continued to distance themselves from the rest of the field in this rotation, but the order remained the same. Smith was the highlight of rotation two, bringing down the house with her floor routine that is so full of personality, charm and sky high tumbling to earn a 14.65. Hernandez did her best bar routine yet, stuck landing and all for a huge score of 15.2. Foberg answered with a huge bar routine of her own, scoring a 14.65. However, it was not enough to stay in the lead, as Hernandez pulled into the lead by half a tenth! Rotation three began with Jordan Chiles on floor, who put together a strong routine after a rough go on beam in rotation two. Christina Desiderio did a beautiful beam routine. While neither was able to break their way into the top three, they solidly held their places in fourth and fifth. Foberg was up first of the top three. She had a super solid go on beam, earning a sky high 9.0 escore and a 14.7. Smith put up a tight, clean vault for a 14.9. Hernandez answered with a 9.0 escore of her own and a 14.7, staying in the lead. The last rotation in an eight rotation battle for gold begins with Foberg on floor. She tumbled more cleanly than ever before, but went out of bounds twice. Still, she improved her score from night one by three tenths for a 14.5. Smith did an excellent bar routine with a stuck landing to cap off her amazing competition and a 14.3. Hernandez needed to improve her night one score by one tenth to tie. She answered the challenge with a 14.55 to take the National Title. 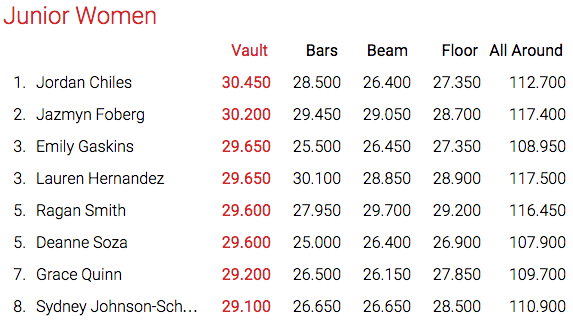 Chiles ended the night with a solid vault and in fourth. The individual events had a few others make their way into the top three. Jordan Chiles won vault and Emily Gaskins took the bronze. Alyona Shchennikova took the bronze on bars and Christina Desiderio took the bronze on floor. The top three all-arounders took all the other medals. Results below with full results on pgchamps.com. Laurie Hernandez, Jazmyn Foberg, Ragan Smith, Jordan Chiles, Christina Desiderio, and Sydney Johnson-Scharpf are the new Junior National Team as the top six finishers. Others may be added in the future. What an epic way to end these three epic junior careers. They are all three eligible for the Rio Olympics next year and definitely made their mark today. Watch the entire competition, it’s totally worth it! Preview of P&G Championships – Seniors. What They Have to Prove.